Coming off of the heels of the New Orleans tricentennial in 2018, nostalgia sets in for memories of what feels like a bygone era. As a child growing up in the New Orleans area, few childhood memories are as fond for me as watching the regional cult classic Morgus the Magnificent every Saturday night. This year is a milestone in the world of science experiments gone awry as Dr. Momus Alexander Morgus, the wacky mad scientist of New Orleans, celebrates the 60th anniversary of his debut. January 3, 1959 was the first airing of Dr. Morgus on WWL TV. The first show was named, "The House of Shock," before becoming it's later incarnation in the 1970's and 1980's titled, "Morgus Presents." As a self-proclaimed member of the Higher Order and a Friend of Science, it was my Saturday night ritual to be parked in front of the television to watch, "Morgus Presents." It was one of those shows my family and I would gather together to watch. We loved his antics, his experiments that always backfired and even the B-horror movies he would host to give viewers entertainment when he was trying to get an experiment to work. It was also hilarious to watch him berate his assistant, Chopsley for goof-ups that would bungle the experiment. His other assistant, E.R.I.C., a talking skull hooked to a computer would introduce the show and end with, "Tune in next week when Morgus Presents." The show aired from the Old City Ice House in New Orleans. The good doctor was a hit with the station and a regular feature on New Orleans televisions sets in and around the metro area for decades and even hit national syndication in the 1980's. 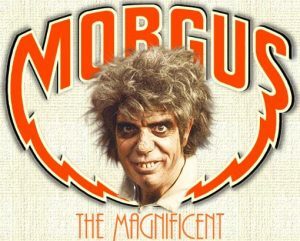 Need an introduction to Morgus the Magnificent? Check out these library offerings! If you need further entertainment or want to revisit the good doctor and his zany experiments and assistants presented with unmistakable New Orleans flair, tune in anytime on YouTube.com.